Homecoming isn’t the only thing happening at Duke this weekend. Kyrie Irving, consensus top-10 recruit in the class of 2010, will be on campus for his official visit this weekend. Since our last update about Irving, the chips have fallen tremendously in Duke’s favor. Indiana, long perceived as Duke’s main competitor for Irving’s services, was abruptly removed from Irving’s list last Friday. Irving will be on campus Friday and Saturday. He will be on the field at the football game versus NC Central when the basketball team is honored for their 2009 ACC Championship. Fellow Duke students, make Kyrie feel welcome if you see him this weekend! Eight years ago, New Jersey native Jason Williams led Duke to its third national championship. Nearly a decade before that, Jersey-born Bobby Hurley helped Duke win back-to-back championships. Is it a coincidence that Kyrie Irving hails from the Garden State as well? What an awesome way to show your support for Kyrie! If he commits this weekend, I’m going to go ahead and guess that this blog will be a huge contributor to his comfort level. Way to do something cool and different, gang. Look forward to seeing these “posters” on campus this weekend. great job guys! love his name written in front of cameron. no way he missed any of those. Good luck this weekend. The feeling is that if Coach K does not get a commitment from Kyrie this weekend, you will end up oh-for-three on the St Pats guys that Coach K has made a major, personal recruiting target. 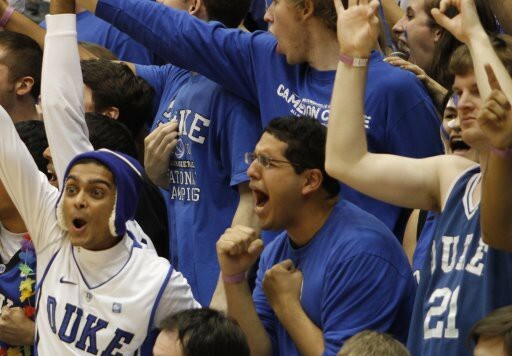 these are the kinds of things that set duke apart from the rest. 6th man at its best. Good work, Crazies. I don’t what other schools do but what you’ve done looks great to me. I sure hope Kyrie makes us happy on Sunday. I hope that Kyrie sees this blog. Pure class from dedicated Dukies. Should make him feel great. Pingback: Crazie Talk » Blog Archive » Breaking News: Kyrie Irving To Duke!